If you’re approaching onboarding as a quick way to get forms signed and mandatory trainings completed, you’re missing out on a boatload of benefits. Sure, there are operational tasks that have to be completed when a new employee starts. But a thoughtful onboarding program can provide so much more. Effective onboarding can deliver results that have an impact on your organization for a long time—maybe even an employee’s entire lifetime. If you want something to last for a long time, you treat it differently. Think about the difference between grabbing a soda can and picking up fine glass stemware or how you interact with a cashier verses your significant other. The same goes for employee/employer relationships: If you want an employee to stay for a long time, you invest time and care. Onboarding is the first place an employer can demonstrate this investment in employees and help them feel supported. In fact, employees who felt their onboarding was highly effective were 48 times more likely to feel highly supported by their organization. This support doesn’t go unrequited: Employees who felt their onboarding was highly effective were 18 times more likely to feel highly committed to their organization. So, when you support employees, they will be more likely to support you in return. How? By staying longer and making their relationship with your organization last. And when we want something to last, we treat it differently: Employees who are committed to your organization invest in the quality of their work and relationships with coworkers. So, not only will you have higher retention by creating an effective onboarding process, you’ll also retain workers who care about providing high value. When employees fully utilize benefits, they get more value from the organization. Like it or not, employees and organizations are involved in an exchange of value. In the best situations, the value exchange is equal. You likely consider benefits offerings a large part of the value you provide, and as such, it’s crucial that you help employees take advantage of the full value of their benefits. Otherwise, they may become unsatisfied and perceive that you’re offering them less than you really are. When employees fully utilize benefits, they’re healthier and happier. Hopefully, you consider many areas of employee wellness when creating a benefits package. Perhaps you have a health plan to keep employees physically well, an employee assistance program (EAP) to address mental wellness, and provide time off to help them have social wellness. A thoughtful benefits package helps employees balance many areas of wellness, and when employees are balanced, they perform better because they’re happy and healthy. Effective onboarding gives employees the knowledge they need to fully use their benefits: Those who reported effective onboarding reported 50% higher benefits utilization. So, when you take the time to help employees understand their benefits, they’ll have a better understanding of the full value your organization provides and be healthier—both of which will help them be better employees long term. While new employees are considering how to make the best impression on you during their onboarding, you should be considering the impression you’re making on them, as well. Onboarding is the first time new employees see the inner workings of your organization, and these experiences help them draw conclusions and create expectations for the rest of their employee experience. One of the conclusions they make is whether your HR team is capable: Employees who felt their onboarding was effective were 113 times more likely to rate their HR department’s capability as high. So, while effective onboarding has many benefits for new employees, it provides a real advantage for you, too. 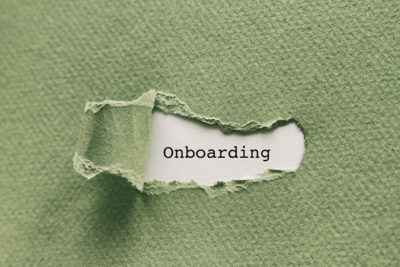 What’s more, onboarding can influence how employees feel about your organization’s performance: Only 11% of people who received ineffective onboarding rate their organization’s performance as “strong,” compared to 80% of people who received effective onboarding. Onboarding is an opportunity for you to set the stage for success with every employee down the road and develop positive perceptions of both your department and the organization as a whole. It’s likely that employees attribute an effective and meaningful onboarding process directly to HR and that this experience leads them to expect that you put as much care into all your initiatives. Imagine how much easier it will be to get buy-in from employees if they view you as highly capable. Whether you’re looking for support for a new culture initiative, guiding employees through a disagreement, or presenting a new benefits package, employees will perceive you as capable and trust that you’ve done your best because you set that expectation on day one with effective onboarding. Onboarding could possibly be the most influential HR program. It’s an opportunity to launch each employee in the entire organization in a positive direction—a direction that sets him or her up to commit to the organization, fully take advantage of the benefits your organization offers, and have a positive perception of both the organization and HR. And these are only a sampling of the long-term benefits. To reap these benefits and more, check out your onboarding program and ensure that what you’re offering is efficient, valuable, and effective. Kelsie Davis is a brand journalist for BambooHR, the leading HR software solution for small to medium-sized businesses. An advocate for high-impact HR professionals, Kelsie researches, analyzes and writes to encourage HR to get the most out their initiatives. The post 3 Long-Lasting Impacts of Effective Onboarding appeared first on HR Daily Advisor.